Dengue fever is fast becoming the most common mosquito-borne disease on the planet. The World Health Organisation (WHO) estimates approximately 40% of the global population are at risk of contracting the virus. It is transmitted primarily by Aedes aegypti in tropical and sub-tropical regions and this highly anthropophilic (people-loving) species has meant dengue has spread rapidly. The virus comprises four types: DEN-1, DEN-2, DEN-3 and DEN-4 and this is part of the reason that there is currently no vaccine or immunological protection. A subsequent infection with a different type of dengue virus leaves the person at risk of complications and Dengue Haemorrhagic Fever. 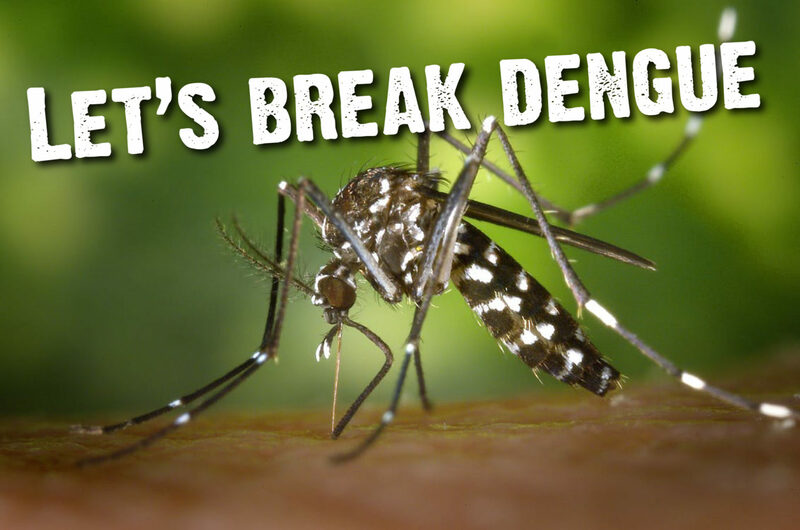 What’s being done to “break dengue”? In 2012, WHO issued the global strategy for eliminating Dengue, leading to a surge in dengue research and publicity. Break Dengue, established in 2013, has been making huge progress in developing publicity, surveillance tools and action partnerships all towards the eventual elimination of the disease. Disease and vector surveillance are very important for a disease which is pandemic-prone. Dengue Track, developed through HealthMap, was launched in its beta phase in 2016 to establish more effective and case reporting of Dengue whilst merging data from crowd surveillance. In 2017, the Association of South-East Asian Nations (ASEAN) ran “Dengue Day” and pressure is growing to continue the global dialogue for Dengue eradication through a collaboration entitled Dengue VOICE. The group plans to present a letter to the UN general assembly in September petitioning for a Global Dengue Day which will, “serve as a rallying point to connect and focus the dengue efforts worldwide.” You can view and sign the open letter here. How can we prevent transmission? As dengue fever lacks an effective vaccine, the primary mode of prevention is controlling the vector. This can be done through removing potential breeding sites and/or treating them biocidal agents. This species bites during the day so treated bed nets are not suitable. Using a personal insect repellent, containing one of the active ingredients DEET, PMD, Picaridin or IR3535, whilst wearing clothing that fully covers the skin is the most effective strategy. Bhatt S, Gething PW, Brady OJ, Messina JP, Farlow AW, Moyes CL et.al. (2013) The global distribution and burden of dengue. Nature 496:504–7. doi:10.1038/nature12060. World Health Organisation (2012). Global Strategy for Dengue Prevention and Control. ISBN 978 92 4 1504034.